1. To get to church on time, I told everyone we had to leave ten minutes earlier than we really needed to. Worked like a charm! 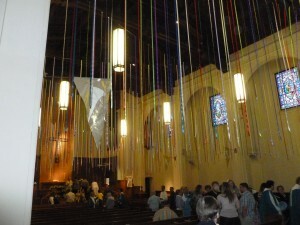 A group of people hung these ribbons of all different colors across the sanctuary. It was breathtaking because it was beautiful and unexpected. 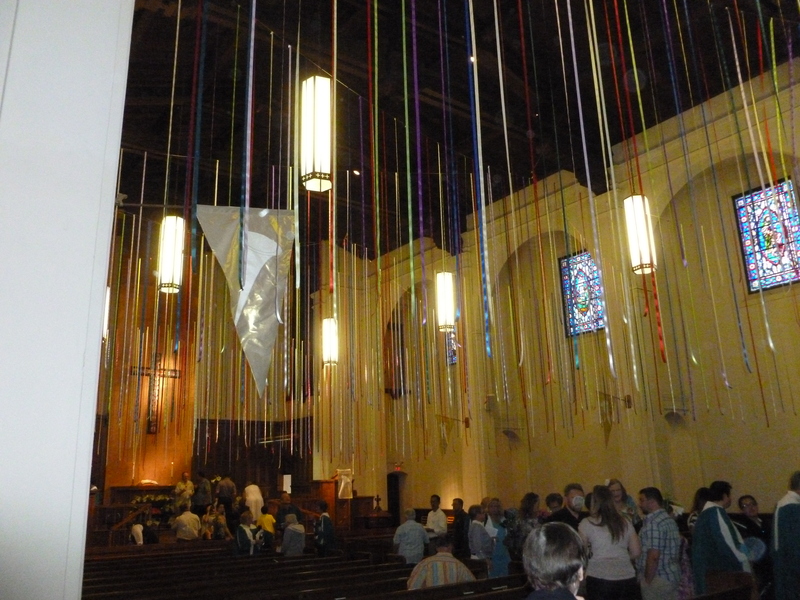 It was also breathtaking because of what it must have taken to make this happen. 3. I discovered that deviled eggs work really well as a chaser after dinner. When you go to the fridge to get out dessert and realize you forgot to put out those two dozen eggs you made, pass them around anyway! Dessert can wait! 4. We crowned Hubby “King of the Grill” after we enjoyed his excellent shish kabobs and grilled asparagus. Yum! 5. I forced Hubby to go for a walk with me to walk off a few of those Easter calories. It was a beautiful evening! Sounds like a great Easter to me! I enjoyed all my kids home for the weekend. We ate too good on Sunday. Hope you have a great week!